Welcome to basically the only real pie recipe on Jessica in the Kitchen! After making this vegan pumpkin pie, friends, I am HOOKED on pie. Since this pie I’ve made Pumpkin Pie Chia Pudding and Apple Pie Bars, and plan to do another full pie soon because how of much I loved this. 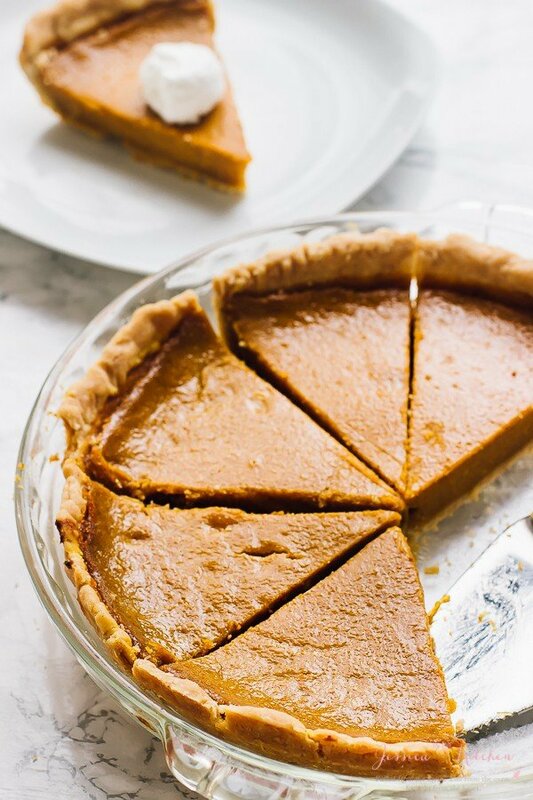 I always thought making pies were hard, but after making this super simple vegan pumpkin pie, I’ve learnt that it really isn’t! Speaking of which, one bite and you’ll be hooked too. This pie is the perfect pie for Thanksgiving, that is a fact. The Mr., who grew up eating pumpkin pie at Thanksgiving, verified that 100% for me. The three slices I had also verified this fact. Oops. P.S. love this? You’ll love my Vegan Pumpkin Cheesecake too! I’ll admit: I did a lot of research on vegan pumpkin pie and was determined to make one without tofu. There’s nothing wrong with tofu, and while I’m adventurous, I just kind of wanted something super simple. In walks with pie. It’s made with coconut milk, lots of real pumpkin puree, maple syrup, cane sugar, spices, and cornstarch. Like, that’s it! Reading this, I just realised just how beautifully simple with pie is, actually. Speaking of the cornstarch, despite the bad rap it gets, it’s not actually bad for you. It’s made from corn, and high in carbs. That’s really about it! It’s the perfect thickener and you probably already have it in your pantry. I use organic cornstarch. Best part, it’s already gluten free! This vegan pumpkin pie baked so beautifully. Like, I was so impressed that I almost literally gave myself a pat on the back. My cool factor is very low right now, so I only mentally did that. It came out as thick as regular pumpkin pie, which was the most important part for me. In terms of taste, WOW. I actually had to give away this pie the same day I made it. Like, I would have been out of control otherwise. It tastes absolutely amazing!! The maple syrup and pumpkin puree flavours blended SO well, and the spices really shone through. Also, the coconut milk added a beautiful silkiness to the pie. Okay, now some tips for this pie. For best results, I recommend making it just like I have. Substitutions can be extremely tempting, but this is fool-proof and already tested so many times that you don’t need to. The only substitutions I’ll “allow” would be using agave nectar instead of maple syrup, and coconut sugar for the cane sugar. I made this using both and loved them both in this. One last note. Apparently I have a deep dish pie dish, so you may have some extra batter if you don’t. DO NOT (*screams*) fill the pie dish to the top of the dish since it puffs up while baking and will overflow (horrors). Fill it up to a bit before the crust ends and you can just freeze the extra, or more mini pies out of it. Then eat those mini pies immediately. I also highly recommend making this, cooling it completely, and then refrigerating overnight. That way the flavours are absolutely outstanding. I even made my batter ahead of time (about an hour) and let it sit for the flavours to blend. This isn’t necessary, but if you have the extra time, it makes the pie even better! 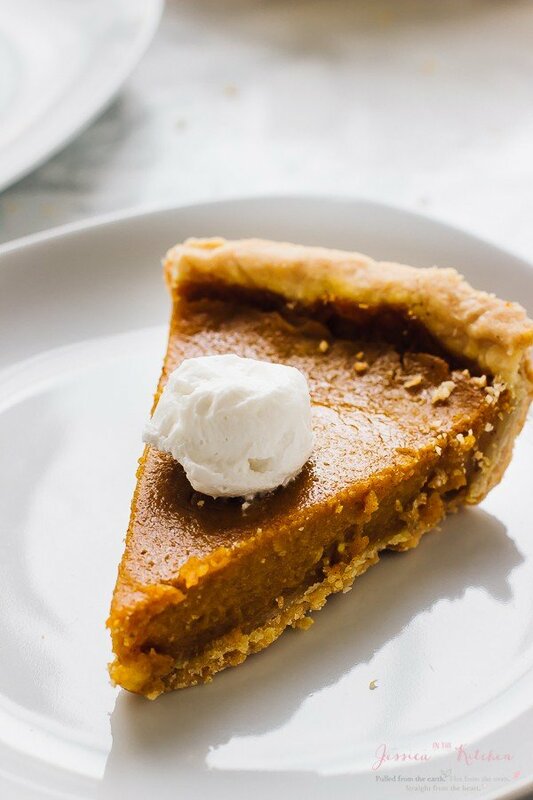 Q: Can I freeze this vegan pumpkin pie? A: YES! You can freeze this for up to 4 days and it’ll still taste exactly the same. Or, you can freeze it for up to a month and it’ll taste very similar, although not as fresh at just baked. Wrap the pie in saran wrap, then in foil, and then place in a freezer safe zipped plastic bag. This ensures that smells and freezer burn will not affect your pie. When thawing, place in the fridge to thaw. Do not thaw on the counter as this will cause your crust to get soggy. If you have raw fish in your freezer, remove this first since this will be the first smell to seep into your pie. Q: Do you have a vegan gluten free pie crust recipe? Preheat oven to 350 degrees F/180 C.
Pre-bake pie crust for 10 minutes. Set aside. In a large bowl, add all the pie ingredients. Blend together well with a whisk until cornstarch is completely whisked out. 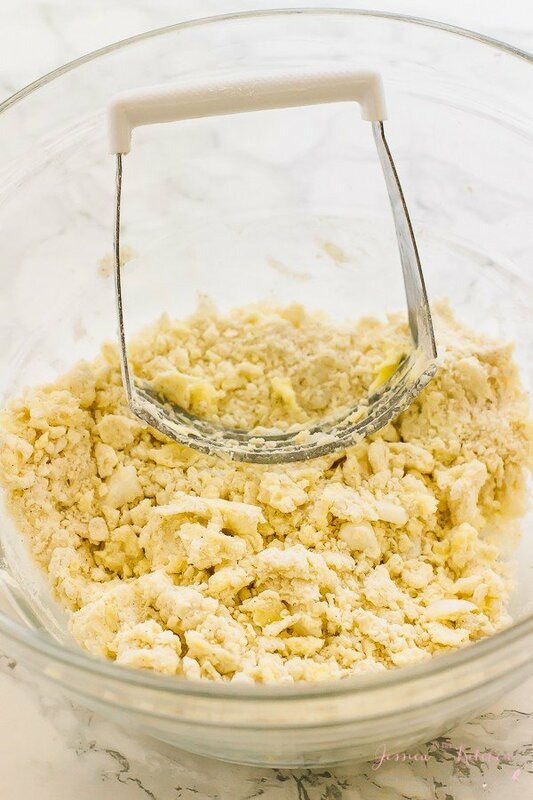 Alternatively, mix all the dry ingredients together first blend out the cornstarch, then add the wet ingredients. 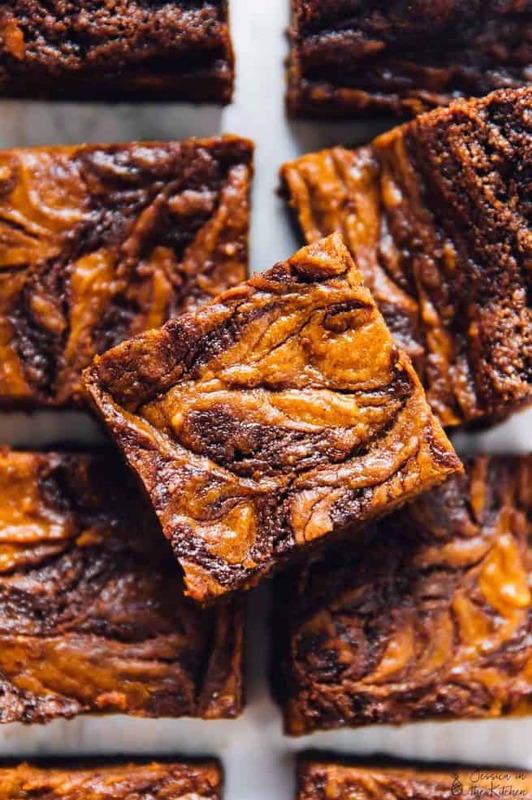 You can leave this to set for an hour covered with a kitchen towel first to allow ingredients to completely blend together, or bake immediately. To me, it tastes even better when ingredients are left to sit a bit. Pour the batter into the pie crust. Bake for 60 minutes in the oven on the lower shelf or highest shelf depending on your oven (furthest away from heat). Cover with saran wrap or foil and set in the fridge for at least 4 to 6 hours, ideally overnight. Remove and cut the pie and serve. Dollop each slice with delicious vegan coconut whipped cream. Enjoy! 0. Some readers have mentioned difficulty separating the white creamy part in the can. This is ONLY if you have been having difficulties. For cans of coconut milk the can usually separates into milk and water, but you can also separate it yourself. 1. I recommend making this recipe exactly as made. If you want to, you can substitute the maple syrup for agave nectar however. To test if your pie is finished baking, stick a toothpick into the corner of the pie. It should be solid. Try not to touch your pie – it’ll leave some imperfections. 2. When your pie comes out, it may be two different colours. This is from the spices in the pie. As it cools and settles, it’ll change to one solid colour. 3. You could spruce this pie up even more by adding a few cookie cutter leaves on top with the extra pie dough. 4. 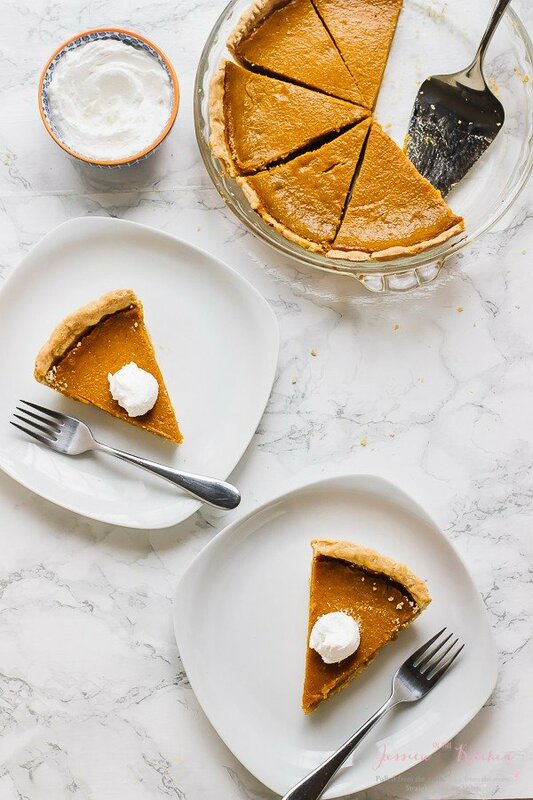 You can store this baked pumpkin pie in the fridge wrapped with saran wrap or foil for up to 5 days. 5. You can freeze this for up to 4 weeks. It will taste the same after a week of freezing, and only slightly different after that. Wrap the pie in saran wrap, then in foil, and then place in a freezer safe zipped plastic bag. This ensures that smells and freezer burn will not affect your pie. When thawing, place in the fridge to thaw. Do not thaw on the counter as this will cause your crust to get soggy. If you have raw fish in your freezer, remove this first since this will be the first smell to seep into your pie. 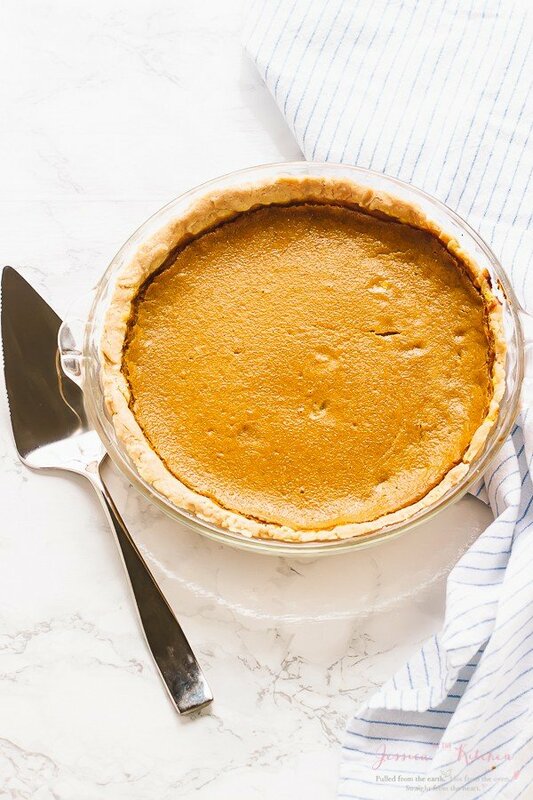 If you try this Vegan Pumpkin Pie please let me know in the comment section below, or tag me on instagram with the hashtag #jessicainthekitchen! For more exclusive recipes follow me on Instagram AND on Snapchat: jessinkitchen. That looks PERFECT! I would love a huge slice! HOW TO STORE You can store this baked pumpkin pie in the fridge wrapped with saran wrap or foil for up to 5 days. Did you mean 4 weeks? months? WHy would freezing keep it good for a shorter period than refrigerating? Definitely a typo! 4 weeks. Thanks! One, this pie sounds delicious. And two – these photos are SO pretty!! Hi Beverly, If you’re on mobile just press “Read More” it’s right there! Otherwise just scroll down the page, and you’ll see the big recipe heading. 🙂 Thanks for your kind comments! This pie is gorgeous!! I have nothing against tofu either, but it doesn’t belong in pie. This looks similar to the recipe I make every year except I haven’t tried one with maple syrup. Can’t wait to give this version a try! PS: Love the video! I’m going to try this recipe. Sounds great. For the coconut milk…are you using it from a can or just the carton? I saw many recipes require the fat creamy part of the canned coconut milk…does yours? Thanks! Mine is from the can! Yes, aim for the fat creamy part. I’m going to go and highlight that in the recipe, thanks! I hope you enjoy! Hi Jessica, im excieted to try this recipe but I need clarification on the coconut milk. Is it just the coconut fat only that is 1 c. Or is it the fat and milk combined as in full fat coconut milk? I dont want to ruin this lol. Thanks for your help. I really hope you enjoy!! So it’s 1 cup of the thick fatty part!! Hope that helps! Hi Jessica! This looks amazing, as does all your recipes. I have one question: I know you said no substitutions, but I’m wondering if you’ve tried arrowroot or tapioca flour in lieu of cornstarch. If so, what were the differences? I don’t see a problem with using organic cornstarch, just curious on how others compare. This looks delicious! I’m currently unable to consume corn (breastfeeding elimination diet!). Are there any substitutions for corn starch that you think I could try?! Thanks so much!! You could use flour, arrowroot starch or tapioca starch. Hope that helps!! Yeah, I was confused by that as well… cornstarch has always just been an ingredient to thicken sauces or add a crunch factor to fried tofu. Not necessarily something you worry too much about. I would think arrowroot would work just as well. Regardless, looking forward to trying this recipe. Yup, arrowroot would work just as well! I used cornstarch because most people already have that in their pantry :). What temp do you cook the pie for? Is it the same as the crust? (350)? Yes! I hope that you enjoy!! Will store-bought pumpkin purée work? Regarding the coconut milk, do I only use the thick, coconut cream part of the canned, full fat coc. milk? Yes! You can use store-bought. You want to use the thick part only! I hope that helps and that you enjoy!! I have made this pie twice, now. Once with canned pumpkin and once with home made. It was delicious both ways! 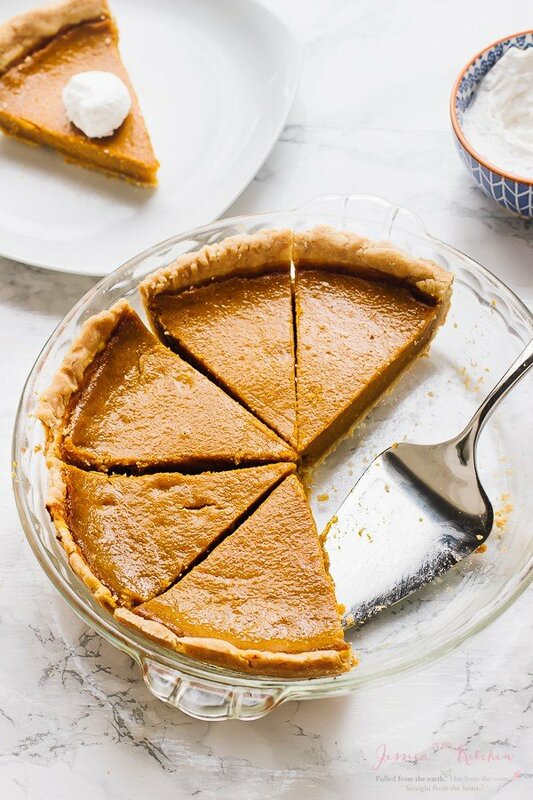 I am so happy to have a “go to” pumpkin pie recipe, since it is my favorite and I haven’t had it in so long, being allergic to eggs. Thank you for the great recipe! Oh I’m SO happy to hear this!! You’re so welcome and Happy Thanksgiving when it comes!! Looks amazing! My only question though, is did you use the whole can of coconut milk or just the hard cream on the top? The solid/hard cream parts: I used this exact method: https://jessicainthekitchen.com/2-ingredient-coconut-whipped-cream/ I hope that helps!! Happy Thanksgiving when it comes!! So, I made our pumpkin purée from a pumpkin that my daughter picked, and I’m thinking maybe this is what did it, but my pumpkin pie is a dark brown instead of a lovely harvest orange color? Is that normal? Lol. Cause everything tasted DELICIOUS in the making process. Hmm, that may have caused it! I used organic cane sugar when I made this, so if you used coconut sugar or any darker sugar, it may contribute to the colour, too. I’m sure it’s perfectly safe and still tasty to eat!! I hope that helps!! Happy Thanksgiving when it comes Esme!! Hey! Can I use anything else instead of maple syrup? If you’re not Vegan you can use honey! I hope that helps! Hi Jessica, looks yummy! If I have shallow 9″ pie plates, this would probably make two pies right? How long should I cook them for in that case? Thank you so much! Thank you! How many inches is your pie dish? Mine is about 1.5 inches in a 9 ½ pie pan, so you can use that as a marker for yours! It sounds like yours would probably make 1 ½ pies or less, depending on the inches! I suggest that you pour the batter ¾ up (similar to the level I did in the video) to see how much fills up, and then make mini pies with the rest in like a muffin pan or a mini cheesecake pan! For the one that fills up all the way, still bake it for 55-60 minutes, and depending on how much batter is left over the rest, you can lower the baking to time accordingly (it’ll be hard to give you a specific time since I’m unsure how many batter would be left over, if any. Anywhere from 20 minutes to 30 should work, but just watch that second one!) I hope that helps Shelly and enjoy! Oh my. This was so good I have already eaten two thick slices. Even better than I thought it would be. Thank you so much for the recipe. I dreamt of vegan gluten free pumpkin pie ever since I have gone vegan. I’m so happy to hear that Karla!! You’re so very welcome and thanks for your comment! Hi, I was wondering if there is a replacement I could use for the coconut milk? I am allergic to coconut and I really want to try this pie recipie. I’m not sure since it’s the thick part you would need. Maybe cashew milk? I can’t guarantee but that would be the closest and thickest milk. I hope that helps! How do I make the pumpkin purée? Did you get to watch the video on the page? Usually in a can there’s the white milky part, and the clear coconut water part. This tip will definitely help! Stick the can in the fridge overnight or freezer for about two hours. After being refrigerated overnight/freezer, turn the can upside down and pour out the liquid on top. Then scoop the solids of the coconut milk out of the jar. Use that part! I hope that helps! NOT a stupid question at all!!! Hi! I am currently making this pie and I’m super excited to see how it comes out! I used canned pumpkin purée and didn’t have allspice so I used pumpkin pie spice instead. In regards to the canned coconut milk, I used the solid portion but it was not enough to make 1 full cup so I just added 1/3 cup of liquid from the can to make 1 cup. Hope it turns out great! I will keep you posted. Hi Brittania, let me know and I hope it does too!! This is absolutely delicious, it turned out perfectly!! Thanks so much for the recipe, Jessica! Hi Kathy, Oh I’m so happy to hear this!! You’re so very welcome!! My daughter is allergic to eggs, dairy and corn. Do you think a tapioca starch might work? Corn is so hard to avoid! Or do you have another recommendation? Oh and to clarify I haven’t tested it, but did some research for you and you can use two tablespoons of tapioca starch to one tablespoon cornstarch so you’d want ½ cup for this! Like I said I haven’t tested it out, so I’m not 100% sure it’ll work but it should! My oven is older and the knobs aren’t exact. What’s the best way to tell when the pie is fully baked? I would recommend buying an oven thermometer which would definitely help to know that it’s on the right temperature. Otherwise, the pie is finished when the top is set, but slightly wobbly in the centre. I hope that helps! So glad you enjoyed the filling! Sounds like something went wrong with your crust! Did you weight out the ingredients? It helps to know so that I can help you out! Aww I’m sooo happy to hear that!! You’re so very welcome and thank you so much for sharing!! I love this pie! I made it for myself for Thanksgiving and was blown away by its silky texture and delectable pumpkin flavor. Sometimes coconut can be a bit overpowering in vegan desserts, but here it simply added a delicate richness. Needless to say, I will be making this again. Thank you Jessica! Thank you for this amazing recipe!!! My son has food allergies to nuts/grains/eggs/dairy/etc. and I didn’t have to make any modifications to this recipe (except that I made it without a crust). We all LOVED the pie! 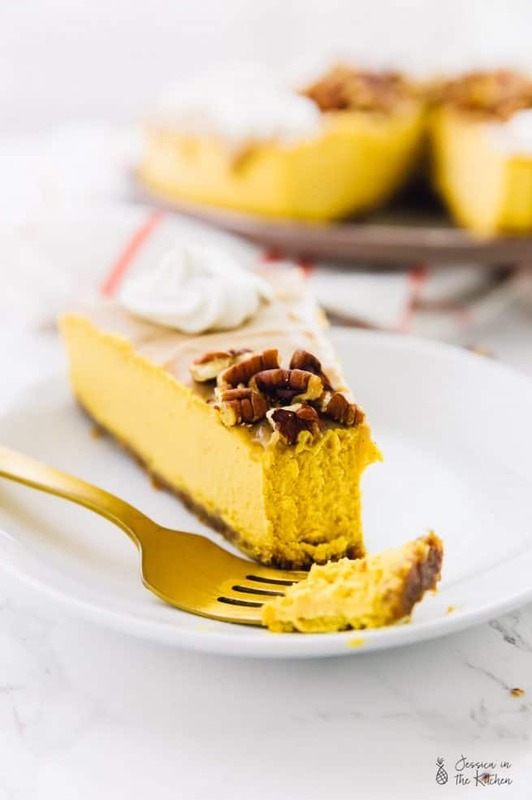 It’s incredibly flavorful and so creamy (almost like a mix between a pumpkin pie and a custard. I have made it twice now and it’s worked great both times. Because I didn’t use a crust, I decreased the baking time by 5 minutes. The first time, the kids ate all of my homemade pumpkin puree, so I had to use canned pumpkin and it still came out great.